Eaton’s Nathan Gard controls the ball as he directs the Eagles offense in a 6-0 win over Brookville on Tuesday, Oct. 2. Eaton has won nine of its last 12 matches to improve to 9-2-4 on the season. 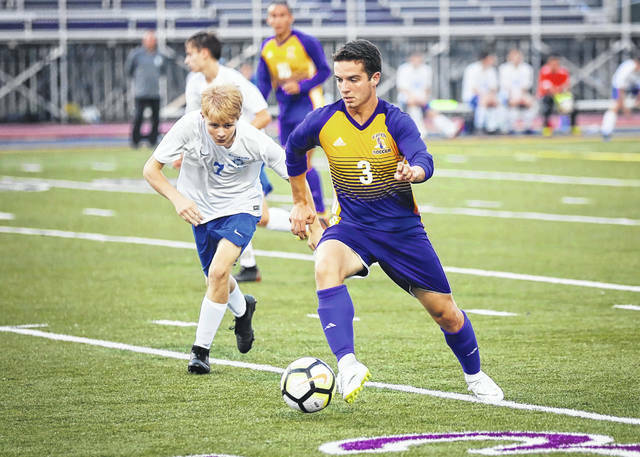 EATON — The Eaton boys’ soccer team pushed it’s overall record to 9-2-4 and kept its unbeaten streak alive with a win and a tie last week. The Eagles have now played twelve straight matches without a loss, going 9-0-3 in that stretch. 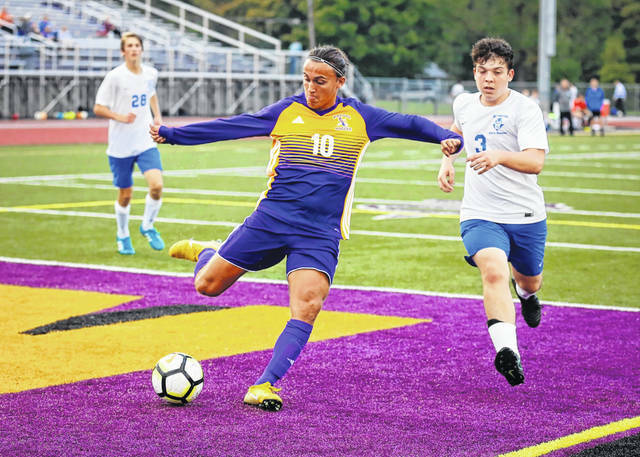 The Eagles dominated Brookville for the second time this season, 6-0, on Tuesday, Oct. 2. They also traveled to Oakwood and came away with a 0-0 tie. Eaton lost its previous match with the Lumberjacks, 4-0, back in August. The Eagles’ season to this point earned them the No. 4 seed in the upcoming OHSAA Sectional Tournament. They will play a familiar opponent in the first round, hosting Valley View, the No. 7 seed, on Monday, Oct. 15. Eaton has a win and a tie against the Spartans in two previous meetings this season. Eaton got off to a slow start against Brookville to open last week on Tuesday, Oct. 2. 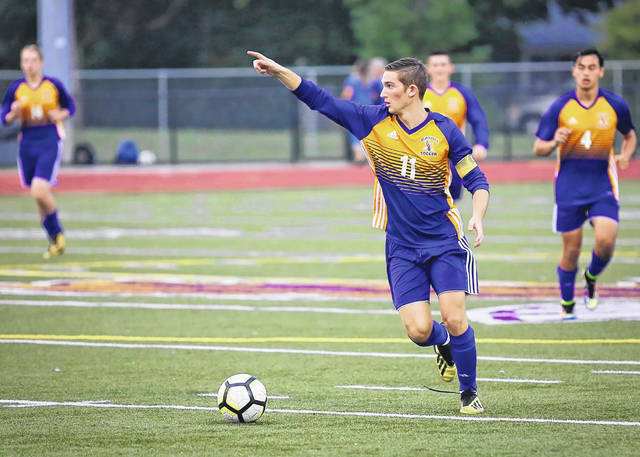 The Eagles’ Tyler Earley got his team on the scoreboard with a goal off a Bradley Gard corner kick. Owen Baumann scored later in the half to give Eaton a 2-0 lead at the break. Goals came more frequently in the second half, starting with a second goal from Earley. This time off of a James Howard header. Howard and Nathan Gard accounted for the next two goals, each with a goal and an assist to the other. At 5-0, the seniors were brought off the field and honored by the home crowd for their efforts. Ryan Brooks rounded out the scoring for Eaton with a goal to make it 6-0. Eaton played Oakwood to a 0-0 tie in a key SWBL match on Thursday. Eaton (6-2-3), Oakwood (5-3-3) and Bellbrook (6-1-3) all trail Monroe in the Southwestern Division standings. The Hornets have yet to lose in the division at 7-0-3. Eaton’s final game of the regular season was scheduled at Monroe on Tuesday, Oct. 9. Twin Valley South dropped a 2-0 decision to Botkins in a Kick for the Cure game on Tuesday, Oct. 2.
https://www.registerherald.com/wp-content/uploads/sites/41/2018/10/web1_EATON-BSC-3.jpgEaton’s Nathan Gard controls the ball as he directs the Eagles offense in a 6-0 win over Brookville on Tuesday, Oct. 2. Eaton has won nine of its last 12 matches to improve to 9-2-4 on the season.